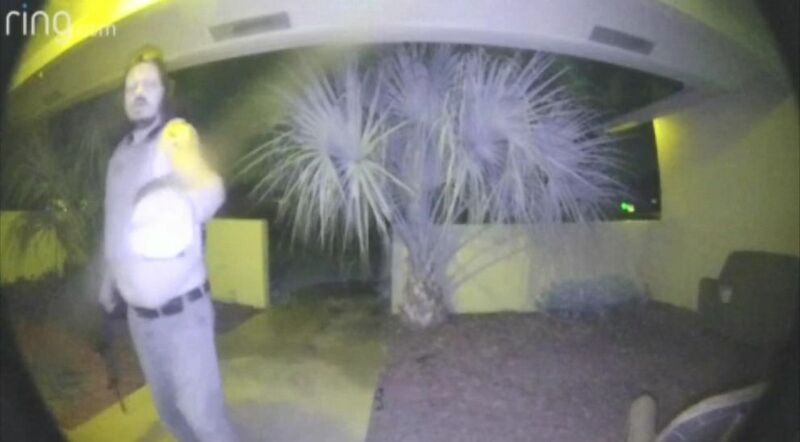 A man was caught on camera walking up to his neighbor’s Florida house allegedly with an assault rifle and wearing a ballistic vest, police said. 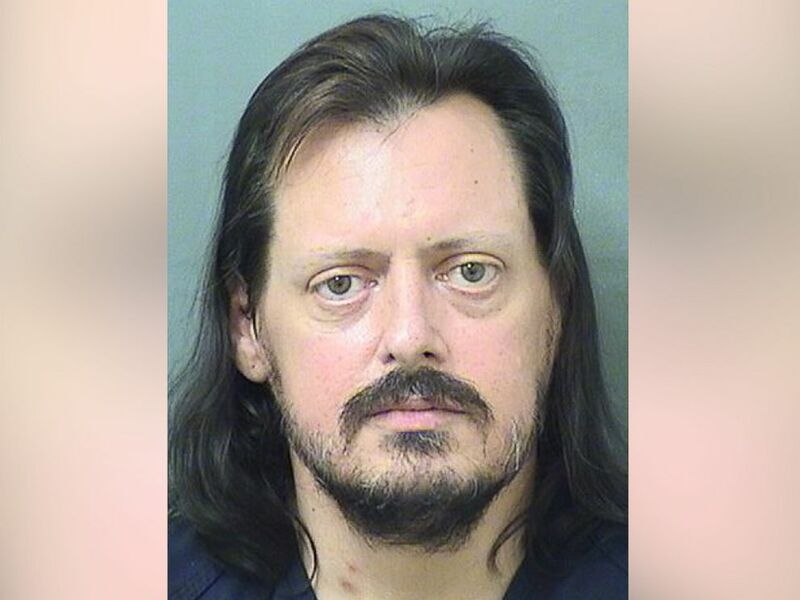 Kevin Flaherty, 48, was arrested on September 6 and charged by the Palm Beach Sheriff's office with three counts of aggravated assault with a deadly weapon without intent to kill. Flaherty allegedly approached his neighbor's house on Fox Hunt Trail in Boca Raton the day before just before 11 p.m. carrying the weapon, according to a report from the Palm Beach Sheriff's Office. Lea D’Errico and her two children, Daniel, 17, and Sara, 12, were in the house at the time and knew about Flaherty's approach because of a “ring” doorbell that alerts homeowners when motion is detected and captures that motion on video, police said. An armed man approached his neighbor's home in Boca Raton, Florida, with an assault weapon and a bulletproof vest. D'Errico and her two children hid in the bathroom, police said. Her husband, Thomas, was away on a business trip in San Diego, but was also alerted by the doorbell, and called his son to tell him that the neighbor was at the house with a weapon, police added. Daniel D'Errico and his father both called 911, police said. Lea D'Errico later told police she was in fear for her life and her children's lives. Lea D'errico was on the phone with 911 in the bathroom when her phone went dead, police said. Surveillance footage appears to show Flaherty walking up to the home with a weapon, and then putting his hand over the camera. Flaherty and the D’Erricos live only 200 feet apart, according to police. It was unclear if Flaherty had legal representation. Thomas D'Errico told ABC News that it took police 25 minutes to respond after the family called 911. When police did arrive, they told the D'Errico's family that there was no threat or crime committed, and that there was nothing that they could do. Thomas D'Errico says that police have since told him that the police mishandled the situation. The Palm Beach County Sheriff's Office did not immediately respond to an ABC News' request to confirm D'Errico's account. Kevin Flaherty is pictured in this undated booking photo. Daniel D’Errico told police that Flaherty’s daughter had left his house a few days earlier because he brandished a firearm at their residence. An arrest was not made at the time, according to the Palm Beach County Sheriff's Office. Daniel D’Errico said Flaherty told his wife and daughter that he was going to kill them, police said, and that this was not the first time Flaherty had threatened his own family with a firearm. Flaherty’s daughter Emily stayed with the D’Errico’s for two nights after the incident because she was afraid of her father, Daniel D'Errico said in the police report. Thomas D'Errico says his daughter was friends with Flaherty's daughter, but that he still doesn't know why Flaherty came to the house with a weapon. "I can't get into that mind, and I don't want to," said D'Errico. "My honest opinion, he came here looking to take out whoever he could and then get in a firefight with the police, because why else would he be wearing a bulletproof vest?" Thomas D'Errico said his family is waiting to see what happens before they return to their home. He installs home security systems for a living, and says that this is why he had a ring video doorbell in his own home. D'Errico said the family had no history of altercations with Flaherty before this, although he did know that Flaherty was having issues with his own family. "He was strange, and we always knew that," said Thomas D'Errico of Flaherty. "We tried to keep our distance."